6.8 Earthquake his the Bouvet Island region. More than 30 wind-driven wildfires scorched 2 500 acres across Kentucky Monday. A number of wildfires broke out Sunday across north-central Pennsylvania and southern New York state. 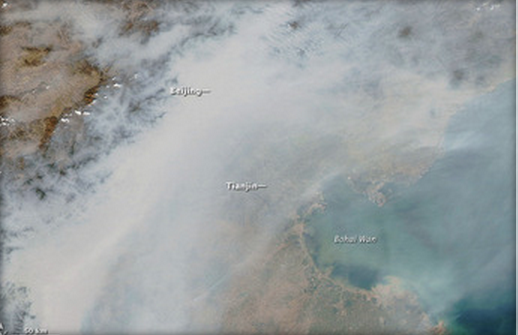 A number of States have declared the start of the wildfire season on 15 April 2014. Australia – Cyclone Ita’s damage to north Queensland sugar cane to cost millions. Sugar cane growers in far north Queensland say about 90 per cent of crops have been wiped out by now ex-Tropical Cyclone Ita. Climate extremes batter U.S. Rockies and Midwestern states – During a time when most of the U.S. is experiencing sunny days, daffodils and spring weather, a swath of states from the Rockies to the Midwest are experiencing a stubborn system of storms, hail, snow and tornadoes. The area is being hit with winter again after being teased with a brief glimpse of spring, and the system will bring bitter cold and snow as it moves east. 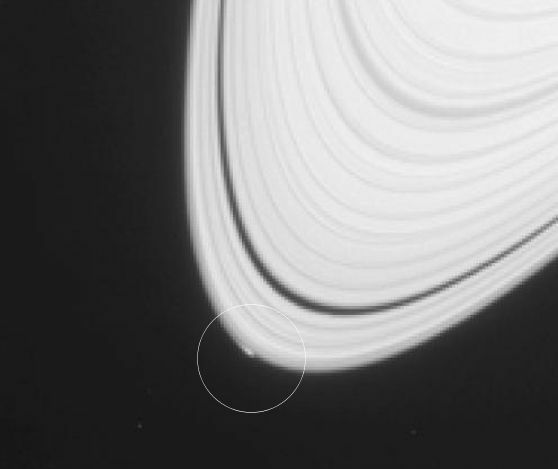 Images taken with Cassini’s narrow angle camera on April 15, 2013 show disturbances at the very edge of Saturn’s A ring — the outermost of the planet’s large, bright rings. One of these disturbances is an arc about 20 percent brighter than its surroundings, 750 miles (1,200 kilometres) long and 6 miles (10 kilometres) wide. Scientists also found unusual protuberances in the usually smooth profile at the ring’s edge. Scientists believe the arc and protuberances are caused by the gravitational effects of a nearby object. Pollution from China’s coal-burning power plants is pumping up winter storms over the northwest Pacific Ocean and changing North America’s weather, a new study finds. North America will be hardest hit by the intensifying storms, which move from west to east, said lead study author Yuan Wang, an atmospheric scientist at NASA’s Jet Propulsion Laboratory in Pasadena, Calif.
Wang said this winter’s unusually cold weather east of the Rocky Mountains could have been influenced by pollution-driven cyclones and high-pressure systems in the northern Pacific. These Pacific weather patterns caused swoops in the jet stream that drove cold air south across the central and eastern United States — the so-called polar vortex. The same weather patterns are linked with record-high temperatures in Alaska this winter. “This cold winter in the U.S. probably had something to do with stronger cyclones over the Pacific,” Wang said. As of 14 April, the Ministry of Health of Guinea has reported a cumulative total of 168 clinically compatible cases of Ebola virus disease (EVD), including 108 deaths. The Centre for Health Protection (CHP), Hong Kong, SAR, China and the National Health and Family Planning Commission (NHFPC) of China recently notified WHO of 2 additional laboratory-confirmed cases of human infection with avian influenza A(H7N9) virus. WHO has been informed of an additional 16 laboratory-confirmed cases of infection with Middle East respiratory syndrome coronavirus (MERS-CoV) from Saudi Arabia and the United Arab Emirates (UAE). Hekla (Iceland): A shallow (around 8 km depth) earthquake swarm including two quakes at 2.7 and 2.9 magnitude has started in an area 12 km to the south of Hekla volcano. Latest GPS measurements suggest a slight trend of inflation is occurring as well, which could be related to magma intrusion into shallow magma chambers. Fuego (Guatemala): The volcano has returned to normal levels of activity without producing a new paroxysm when activity climbed during 10 April. Intermittent explosions of strombolian type and small to moderate size were heard during the past 24 hours, but could not be directly observed due to cloud cover. Reventador (Ecuador): Activity continues at moderate levels with small intermittent explosions, but (probably) no longer active lava flows. Most of the time, the volcano is hidden in clouds, but this activity can be inferred from seismic and satellite data. Tungurahua (Ecuador): Activity decreased during 12 April, but has quickly picked up again. The volcano continues to show intermittent small to moderate vulcanian explosions with ash emissions of up to 3 km above the crater, accompanied by loud detonations and shock waves. In addition, strombolian activity were reported by the observatory. Lava blocks rolled down on the southern flanks of the volcano to distances of approx. 1 km. No reports of ash fall were received. The lava flow from 10-11 April appears to have stopped. Ubinas (Peru): The volcano’s activity increases. As more magma arrives to build up the new lava dome in the summit crater, more gasses are being released as well and cause near-constant explosive activity with moderately strong ash emissions at the moment.